The journey to the recording for the lyrics to "A Tear" has been a long and winding road. Lag BaOmer 5752, Yair Medina Levy finds himself for the first time on the roof of Rebbe Shimon Bar Yochai’s grave in Meiron. The charged and uplifting atmosphere move him to tears of joy and the words of an other wordly song are born. Nine years later his cousin, Shlomo Medina, sets the lyrics to music. The song is passed to Yizhar Shaabi who occasionally plays it on stage, but never records it. Now, 17 years later, Yizhar Shaabi and Yair Medina Levy are dedicating this project "in honour of Rebbe Shimon Bar Yochai and in honour of Am Yisrael". Lag BaOmer falls this coming Monday, till then Jews refrain from playing or listening to music during sefirat haomer. 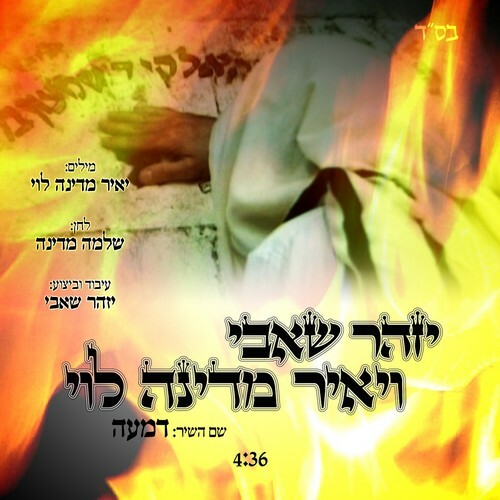 The night of Lag BaOmer, is the hilula (yahrzeit) of Rebbe Shimon Bar Yochai, which gives the sign that music can be heard once more. Yizhar Shaabi invites you to share tears of joy at this new song, released here. Just weeks ago Shaabi brought out his first official album "Lev Tahor". The album has already sparked great interest. An exciting clip has been produced of "A Tear".